MIL907244011 Features: -STYLE CONNECTORS. -UNSPC CODE: 23271400. 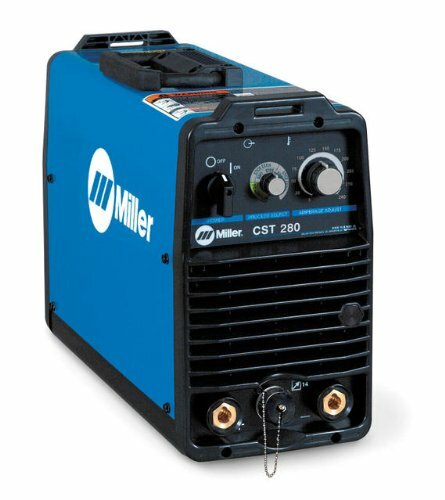 -CST-280 Durable yet lightweight Stick/TIG welding power source designed for construction industry. 280 amps of output is ideal for stick electrodes up to 3/16 in and TIG welding pipe and plate.. Product Type: -Tig welders. Product Type: -Stick welders. Duty Cycle Percentage: -50%. Duty Cycle Percentage: -100%. Maximum Voltage: -230 Volts. Output Amperage: -280 Amps. Generic Specifications: -Inverter-based, DC power source has a SIMPLE-TO-USE OPERATOR INTERFACE providing ony the necessary controls in a compact machine. PROCESS SELECTOR KNOB automatically sets the PROPER DIG setting on E6010 & E7018 and adjusts amperage. Superior Stick arc performance even on difficult-to-run electrodes like E6010. DURABLE & PORTABLE, 40 LB aluminum case is easy to install with 230 V or combination 460/575 V input. Adaptive HOT START for Stick arc starts automatically increases the output amperage at the start of a weld should the start require it. Prevents the electrode from sticking and creating an inclusion. Lift-Arc start provides TIG arc starting without the use of high frequency. Remote amperage control provided through 14-pin receptacle on front of machine. This permits use of standard amperage control devices.. -CST 280 220 230/460 575 TWECO.